2nd place winners at Thomas Point Beach 2018 Band Competition!! Open June through Labor Day. Live music by the water's edge every Wednesday & Sunday in the summer. Serving 5:00 - 9pm. Reservations are strongly recomended on live-music nights. Description:TUESDAYS AT THE GAZEBO will be bringing another summer of music and community enjoyment at the beautiful Gazebo in front of the Turner Public Library. Rain or Shine, concerts are 6:30 – 8:00 pm. approximately, with musicians arriving earlier to set and tune up. In case of rain, we go downstairs, in the community room, under the Library. Suggested donation $5:00, as this is how we pay the musicians. We pass the hat. There is no town funding. 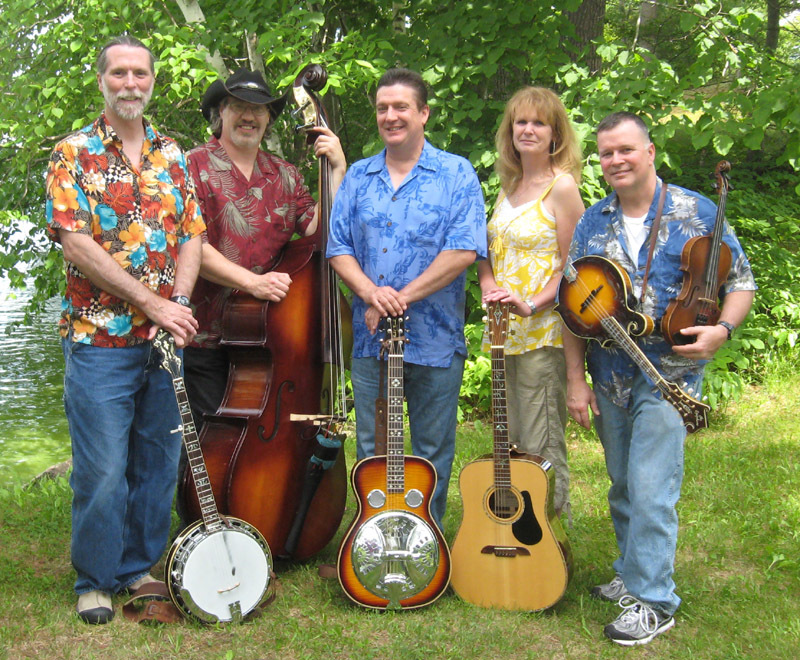 Some of the Greatest Bluegrass music you can see and hear at one of the largest family musical events in New England! The Blistered Fingers Bluegrass Festivals has something for all ages and it takes place twice every year bringing thousands of Music lovers from all over the World to hear banjos, fiddles, and those high, lonesome harmonies which features many National and Local bands from all over the world. Founded in 2011, Back Woods Road is a highly energized acoustic band known for its tight harmonies, hard driving lead solos, and crowd-pleasing varied choice of music and arrangements. There’s never an ordinary song for this band. They take it up a notch and one further. Members are Rich Bernier (dobro, guitar, and vocals); Jane Bernier (guitar, mandolin and vocals), Mike Conant, (fiddle and vocals), Jason Wescott, (guitar), Hunter Webber (banjo) and Shawna Bell (bass). Like a Phoenix, Back Woods Road rose out of the ashes of Maine bluegrass band “The NitPickers”, and took wing originally as a trio playing folk, rock, blues and country as well as its staple of bluegrass band/newgrass band tunes that they had become known for. With close-knit harmonies, sizzling guitar/dobro licks and melodic bass lines, Back Woods Road is establishing itself as a must-see acoustic band. As The NitPickers, they recorded a self-titled CD and performed twice on the “207” show on NBC Channel 6. As Back Woods Road they appeared twice on the Fox 23 “Good Day Maine” morning show. Back Woods Road have continued touring regionally with performances at various festivals in New England and other high visibility venues such as The Brunswick Outdoor Arts Festival, Sunday River and Sugarloaf ski areas, the Brunswick Music on the Mall Series, Podunk Bluegrass Festival, White’s Beach Bluegrass Festival, Blistered Fingers Bluegrass Festival, Thomas Point Bluegrass Festival, Pemi Valley Bluegrass Festival, Country Fest Maine, County Fairs and more. “These guys do their homework. Complex arrangements, executed with polish and a command of dynamics”. “Their three part harmonies are near perfect and the fact that their voices are so different from one another works in a way you wouldn’t think possible”. “It is worth the trip to see these guys. BWR puts on a good show… it is exciting to watch and different every night”. “Bernier’s fill and solo work are spontaneous. You don’t hear the same licks in the same places from show to show”.